Modern t.-p. inserted between the 2d and 3d preliminary leaves of the SUNY Buffalo State facsimile of William Shakespeare's First Folio from 1866. Perhaps our best clue about the marginaliast’s identity is the piece of paper shown here. 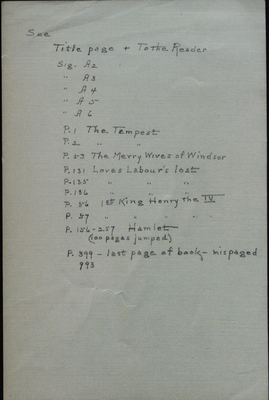 This paper, a list of where marginalia was added to the text, was inserted into the SUNY Buffalo State First Folio facsimile at some point after the book’s publication. We can be fairly confident that the paper was inserted into the First Folio facsimile by the marginaliast him- or herself for a couple of reasons. First, the handwriting on the paper is identical to the script used throughout the Folio by the marginaliast. Second, the list is written on a piece of paper evidently contemporary to the marginaliast, not to the First Folio facsimile itself. This means that, if we were able to date the paper, we would be able to precisely date when the marginaliast was actively scribbling in the facsimile. This list also supports the theory that the marginaliast knew what he or she was looking for in the First Folio before even starting to read the plays. It’s a “crib sheet” for the marginaliast, probably culled from a variety of sources (as discussed previously), as well as a helpful reference for finding his or her notes later. While we have not yet been able to date the piece of paper, researchers at SUNY Buffalo State are currently working to determine a precise date for the paper and, thus, the marginaliast.